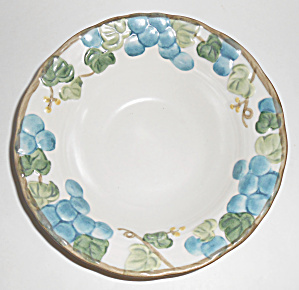 This is an offering for a pristine Metlox Poppy Trail Pottery Sculptured Grape 7-1/4" wide cereal bowl. Ink marked 'POPPY TRAIL BY METLOX MADE IN CALIFORNIA'. This is as clean as I've seen of Metlox Sculptured pieces in over 20 years. Not a hint of use and has no nicks, chips, cracks or repairs. Shipping for this wonderful addition to your collection is $8.95.